Have you ever wondered what life would be like if you could switch places with someone for just a day? I think, if we’re being honest with ourselves, we all have longed to swap lives with someone else. But here’s the funny thing about desiring to live another life – we never do it when we’re content in our own lives. The reason, of course, that we dream about what it would be like to live in someone else’s shoes is because we’re prone to a “grass is greener on the other side” mentality. When we lament the way that our lives turned out – our lack of jobs, fortune, romance, functional families, friends, etc. – we tend to covet the lives of people we feel are better off in those areas than we are. We long after a life that wasn’t ours to have, while those individuals are (likely) longing for lives that they don’t have as well. It’s a viciously ironic cycle, this coveting of someone else’s days. But we like to play pretend. When we’re kids, we play “house,” and use plastic swords to ward off invisible monsters. Because the truth is that we’re all dreamers, in some fashion, and reality… well, reality often squelches those dreams pretty quickly. So what does “Basic Human Anatomy” have to do with this notion of living vicariously through someone else? If you watched the episode, you’ll know that it has nearly everything to do with this idea. Troy cannot bear to face a conversation that he needs to have with Britta. The solution, for him, is the adult version of “playing pretend” (or, well, maybe not the adult version) by reenacting a body swapping movie with Abed. And at the end of the episode, no matter how painful the process, Troy has a second “Mixology Certification” moment of growth. And it’s pretty beautiful to behold, regardless of the bumps that were encountered along the way. This episode was penned by the wonderful Jim Rash (@RashisTVUgly), and I thought it was a great idea to have Jim write an episode of Community. For one, this is an Academy Award winning writer, so we all know that he is talented. But what I enjoyed more than the fact that he is an award winner is the fact that Jim has been on this show for four years and therefore understands the characters in a separate but similar level that the writers do. Writers and actors are so distinct in their drives and motivations, but also cohesive in their end goal. It’s this delicate balance, really, that the two groups walk – both writers and actors have distinct voices, but have to merge those voices into one project so that it flows cohesively. What’s really cool (pardon the lack of a better word) about Jim writing this episode was that we – the audience – got a glimpse behind the curtain as to how Jim views the characters on this show both as a writer who is creating scenes, and also as an actor who is portraying them. Jim Rash knows what motivates Dean Pelton – he understands what the driving force of his life is, as a character. I think, too, that Jim understands the choices that the rest of his castmates make in portraying their own characters. While the writers, to a point, are fundamentally immersed in who they believe the Greendale Seven to be, the ACTORS are the ones who bring those lines to life. They, then, unearth hidden motives and secret meanings. They decode their scripts and extract their own character’s desires from those lines. And I think that it was a smart move to have someone who has been on the other side of the camera for so long actually write these lines with that knowledge, likely, in the back of his mind. Basically, I just want to give a massive amount of props to Jim Rash for the episode, if you can’t tell. Jeff insists that they need to come up with an idea that is both doable and passable. Apart from that, he’d like to be done with the assignment as quickly as possible so that he can enjoy his weekend. Annie, however, notes that she needs a good grade in order to stay on top, since she took a C+ on their previous assignment in order to help the group. Shirley isn’t quite fond of the fact that Annie is dismissing her as a potential candidate for valedictorian. I know I’ve read some comments regarding Annie/Shirley and their storyline that seems to be developing in regards to their competitiveness and jealousy of one another. I’d comment on this as being out of the ordinary for the pair, to fight over becoming valedictorian, but… well, it’s not quite out of the ordinary. With the exception of “Communication Studies,” where they bonded together over a common enemy, Shirley and Annie have never really seen eye-to-eye. Shirley is a mother, which causes others to (unfortunately) lose respect for her as an independent woman. Similarly, Annie’s youthfulness often causes others to (also unfortunately) lose respect for her as well. Both are so similar, fundamentally, but vastly different exteriorly. And I think that – as I have said before – that’s the heart of Community pairings. Nevertheless, Shirley/Annie stories have always found the two competing with one another (“The Science of Illusion,” “Herstory of Dance,” “Intro to Knots”), and this episode is no different. Actually, scratch that, friends. This episode IS different in that we see some development in Annie as character that we do not get in any of the other episodes. But more on that later on! I suppose this episode is similar to “Communication Studies” in that Shirley and Annie are forced to put aside their own personal motives in order to ensure that Leonard does not procure the position of valedictorian. It’s nice to see that even though they’re both vying for the coveted spot, they would rather have one another succeed before they’d allow Leonard to do so. Ah, and now we come to the Troy/Britta segment of our review (which will, of course, resurface quite frequently throughout the remainder of the post as well). Emotionally, I have to give enormous credit to Jim, but also to Donald and Gillian for making these characters feel believable for the brief time we were allowed to spend with them. I’ll admit it – I didn’t love or even like the way that these characters were handled as a pairing. It saddens me because Troy/Britta had a lot of potential to be wonderful. But it’s almost as if the writers threw them together for the sake of them being together and then were unable to determine how to proceed from that point. And that’s what frustrates me, to be honest, with the show. I completely admire the writers for what they do with their episodes, but romantic stories have never really been the show’s strong suit, and it is evident in seasons such as this, with the utter demise of what could have been a wonderful relationship between two awesome characters. I DID tear up at the end of the episode, and my heart ached for Britta as a character. But truthfully, when it came down to it, I mourned the loss of what-could-have-been with Troy/Britta more than I mourned the loss of what-actually-was. I think something that really threw me during this episode, also, was how insecure Troy was. It jarred me because since “Mixology Certification,” I have come to view him as a man. I realized, during that episode, that I had always seen him the way the rest of the group had: goofy, young, and gullible. But after watching Troy rescue his friends from themselves, thereby sacrificing celebrating his own special day, I realized that I had been wrong about the young man. Watching “Basic Human Anatomy” made me realize that this character isn’t as put together as I might have believed (or hoped) him to be. Last season, we had come to view Troy as the savior of the group. He sacrificed himself to the Air Conditioning Repair School in order to ensure that his friends were safe. That his school was safe. Troy does so much for others that sometimes I forget he has insecurities and fears just like the other characters, though they may not be as evident on the surface. And perhaps this episode left me feeling unsettled because it was meant to. We know that Jeff is flawed and scared, and we have known that from the beginning. To view a hero, like Troy, in that light is foreign. And it’s scary. Troy and Britta are notified by Shirley and Annie that the following day marks the one-year anniversary of their first date. The two awkwardly agree to celebrate by recreating their first date at Senor Kevin’s after forgetting the anniversary. What Troy doesn’t forget, however, is that he is celebrating the three-year anniversary of when he and Abed watched “Freaky Friday” together. “Ohhhhh. That you remember?” Shirley and Annie quip in unison. Here’s a bit of fun for you: even when Shirley and Annie are supposed to be at odds, they are still in sync with one another. Even when Jeff and Annie are at odds with each other, they still gravitate (… don’t even hum it) toward one another (i.e. “Asian Population Studies”). I know this was meant to be a parody line of something that would be said in “Freaky Friday” (just as Abed’s preceding and following lines were), but it’s actually quite revealing to the audience because this is the last bit of Troy’s honesty we will see until the episode ends. The athlete actually laments the fact that he has emotions – he knows, in his heart, that his relationship with Britta should feel easy; it shouldn’t feel like they’re simply going through the motions. He wishes he could play pretend and be Abed for a day: life as Abed would be easier and he would be able to run away from the emotions that are causing him pain. 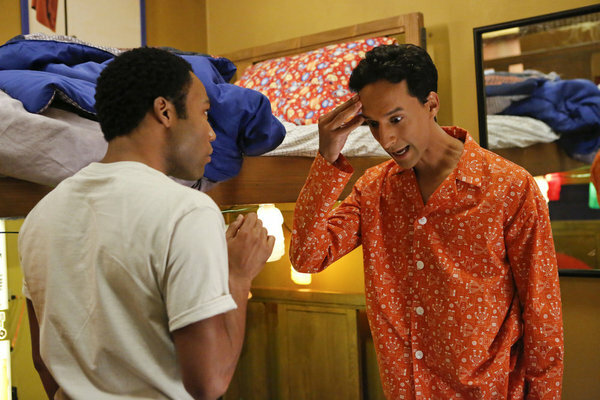 Let me just take a moment to praise Donald Glover and Danny Pudi for their INCREDIBLE acting throughout this episode. They seriously picked up on the vocal fluctuations, physical ticks, and nuances that they each have while playing their respective characters and mined them so effectively. Donald’s performance as Abed was just so spot-on, and Abed really matched the vocal inflections that Donald gives to Troy accurately. They both, comedically, were fantastic as one another. But the moments that they were allowed to completely shine were in their serious scenes later in the episode. Truly, I have so much more respect for them as actors now (and I already had so much to begin with!). But Troy and Abed don’t swap bodies in the study room that day. The next morning, however, both of them awake to find that they’ve inhabited the other’s body! Dun dun DUN! In the study room the following day, Annie is instructing everyone on the construction of their banners (the project the group decided to do for History), noting that there are different stations that include various mediums of decoration. Approaching the study room table, she insists that everyone will have to run their banner by her and Shirley and if it is rejected, will have to start over. Jeff kindly reminds everyone (and not so kindly momentarily) that they need to make their assignment “doable and passable,” as he wants to be home early for the weekend and also to graduate. Annie reminds him, however, that she and Shirley have their focuses set on beating Leonard, who is the current valedictorian. Though they each are committed to beating Leonard, Annie and Shirley also are still intent on beating one another for the spot. Troy and Abed both walk into the room and insist that they’ve swapped bodies, which obviously isn’t being bought by the study group (especially Jeff). Troy-as-Abed reminds the group that in order for them to switch back, he has to locate the DVD and recreate the exact moment they swapped bodies in the first place. That leaves Abed-as-Troy to go on the anniversary date with Britta. (This, of course, is a way for real!Troy to avoid confronting the fact that he and Britta don’t have the same relationship as they once did.) It’s a way for Abed to deliver the news to her, since he confides everything in his best friend, than Troy deliver it himself. It’s a cowardly move, and one that Jeff calls real!Troy out on later in the episode. As Troy-as-Abed leaves the room to find the DVD, Abed-as-Troy leaves as well. Britta goes after Troy (she’s not quite sure which person she’s looking for, and neither are we), while Jeff’s frustration is simmering in the study room over the abandonment of the group project. I love that Jeff, in spite of the ridiculousness, takes responsibility for solving some of the issues within the group and delegates the rest out to the others. Even though he is clearly acting on selfish motives (he needs a passing grade in order to graduate and that’s his main concern after all; it’s also, notably, not a BAD selfish concern. He SHOULD be concerned with graduation. I was! ), he is still willing to go out of his way and try to fix problems that weren’t his to fix in the first place. Really, I think that’s the characterization of Jeff from pilot to this season in a nutshell: he began as a character who wanted nothing more than to wipe his hands of these six individuals. So, he broke them in order to get what he wanted. And now? He bends over backwards to fix them. Oh, Jeffrey Tobias Winger. Jeff enlists the help of Dean Pelton in putting a stop to Troy and Abed’s body swap adventure, but… well, the dean isn’t much of a help at all. In fact, he decides to “swaps bodies” with Jeff for the day. This, meanwhile, causes Annie to hilariously question, aloud, what is wrong with her later on in the episode when she can’t stop giggling and fawning over Dean Pelton. We know, Annie, that you’re attracted to anyone who remotely exemplifies Jeff Winger’s characteristics. It’s understandable. Though yes, slightly creepy in this episode and Annie finds herself creeped out by her responses to the dean as well. Britta and Abed-as-Troy sit down to lunch, the former still convinced that she can perform some therapy on Abed in order to understand why he feels the need to pretend to be Troy. What she doesn’t realize, of course, is that though this is true (Abed is still Abed throughout the episode and Troy is still Troy), it is not ABED who she needs to be worried about. Britta is convinced that Abed will end up folding in on his Troy persona once he encounters the manager of Senor Kevin’s (in whom he was locked in an epic rivalry over the waiter’s strong distaste for “Die Hard”), but the film student does not. And I think that this is because, fundamentally, Abed understands how important it is to Troy that he spends the day away from feelings and emotions. Abed knows how Troy feels regarding his relationship with Britta. And thus, I feel that their decision to do a body-swapping adventure is rooted more in the fact that Abed has compassion for his best friend than anything else. Jeff’s level of frustration with Troy, Abed, and the lack of any progress on the DVD front (or simply convincing them to drop their act) comedically progresses as the episode wears on. Still, he plays into Troy-as-Abed’s shenanigans and agrees to look for the DVD with him. Much like in “Pillows and Blankets,” Jeff merely wants to put a stop to the absurdity between Troy and Abed. It’s important to recognize the fact that Jeff never understands WHY, even at the end of “Pillows and Blankets” Troy and Abed were at odds with one another. He doesn’t know why there had to be a war. All he knows is that he’s Jeff Winger and their fighting was encroaching on his time and in his relationships. In “Basic Human Anatomy,” the same principle applies – Jeff doesn’t understand WHY Troy and Abed pretended to swap bodies; he just knows that he needs to put an end to it, no matter what that entails. And I think that it’s wonderful how humbled Jeff is when he realizes that they’re not just “acting like dorks” – Troy is actually suffering, emotionally, and hiding behind the façade of the body swap is easier than dealing with his actual issues. The conversation that ensues between Britta and Abed-as-Troy at the restaurant is very poignant. Abed reveals information that he knows about Britta, having been told it by Troy. When Britta insinuates that Abed might be feeling awkward around or take some issue with Troy and Britta’s relationship, the film student rebuffs the statement – Abed isn’t invested in Troy and Britta’s romantic relationship. In Troy’s voice, however, Abed-as-Troy explains that Troy talks to Abed about his relationship with Britta. The blonde appears hurt at the insinuation that Abed is more of Troy’s confidante than she is. But I think it’s truly important to note the shift in narration throughout this episode. If you can’t keep up (it took a lot to keep up with the shifts), it can get confusing. Troy and Abed narrate their thoughts as themselves, partially, but in the restaurant, Abed is vocalizing TROY’S insecurities and thoughts to Britta. Abed-as-Troy notes that if things were so good between Britta and Troy, that remembering an anniversary should have been like second nature. Instead of celebrating, he insinuates, they’re merely coasting in their relationship. Back at Greendale, Troy-as-Abed and Jeff are scouring for the lost “Freaky Friday” DVD, and decide to question the janitorial staff as to its potential wherabouts. Jerry, our favorite janitor, points them in the direction of the Lost & Found room. Jerry takes Troy-as-Abed and Jeff to the Lost & Found room… which is filled to the brim with pallets of items. And now comes one of the most telling parts of the entire episode – Jeff confronts Troy-as-Abed about dropping the bit and ending the charade of a body swapping adventure. Jeff says that if he was truly a friend to Abed and to himself, he would end it. But like “Pillows and Blankets,” Jeff gets irrationally mad at the young men without understanding why they’re acting the way that they are. Troy-as-Abed reveals that he has the better end of the body swapping adventure: he’s sent Abed to a date with Britta. When Troy-as-Abed explains that he doesn’t understand why Troy would want to be in a relationship anyway, that halts Jeff from leaving. Meanwhile, Abed-as-Troy explains that he hasn’t felt a distance between himself (er, real!Troy) and Britta for very long. The camera pans back and forth between Senor Kevin’s and the Greendale Lost & Found. We, the audience, are then able to piece together the fact that both conversations are Troy’s inner thoughts. Of course, the real Troy is left vocalizing these to himself and Jeff, while Abed is left to actually be the one to explain to Britta how Troy is feeling. And Troy, cowardly, leaves Abed to break up with Britta rather than doing it himself. It’s really beautiful and heart wrenching to see Troy vocalize his fears to himself as Abed. He’s afraid of breaking up with Britta, because he doesn’t want to destroy their friendship. But he’s also afraid of staying together with her because he doesn’t feel growth. In the end, he’s left in a complex situation with no way of escape… except to play pretend. Troy explains to Jeff that if he were to ruin his friendship with Britta: “He’d hate that. He’d hate himself.” That line absolutely gutted me. I never think of Troy as someone who would feel so much guilt over anything that he would hate himself. But, as he vocalizes to Jeff, he WOULD. Jeff’s Winger speech this week is all kinds of beautiful and also tragic. It’s all about commitment which is something Jeff admits to struggling with. (Also, it’s so nice to see that Jeff acknowledges in this scene and the one prior that he believes Troy and Abed truly switched bodies). He wishes he could commit to a bit like Abed could or to a relationship like Troy could. There’s this moment, right after Jeff utters the last line that snaps Troy back from his game of pretend – you can see, in his eyes and face, that this moment resonates with him. It is an echo of what Jeff said to him in “Mixology Certification,” and it was the catalyst Troy needed to do the right thing. Because as grown-up as he is, there is still a part of Troy that craves Jeff’s approval. He still looks up to him, believing that Jeff has more answers to life than he does. And so, wisely, Jeff advises him to do what he already knows is right. Troy shows up at the restaurant, and he and Abed switch back because – as Troy says – “Britta deserves better.” She deserves to have a conversation with real!Troy. All of Troy’s motives were to protect Britta throughout this episode, even though he was also trying to protect himself. He was so afraid of hurting her, that he ended up inadvertently doing so by refusing to face the fact that they needed to break up and sending Abed to do it instead. Playing into the body swap trope (and the episode trope), Jeff flickers the lights at the restaruaunt as Troy and Abed switch back and explains: “Sorry, routine light switch check.” And that, friends, is how Jeff wins the episode. Also: there is another really nice parallel to “Pillows and Blankets” in this episode. At the end of that episode, Jeff actually went back to retrieve the friendship hats for Troy and Abed because he believed so strongly in their friendship. In this episode, he flickers the lights and quietly indulges their body swap adventure because he believes – again – strongly in them both. Troy and Britta’s break-up is one of the most heartbreaking things to happen on this show. It’s evident how much Troy cares for her, and it hurts to listen to him talk about how HE isn’t ready for their relationship – how he believes that his actions prove that. Rather than fight him and try to explain that he is NOT that person all the time, Britta understands. She always understands him. And he always cares about her. Later that afternoon, the group walks back into the study room to attempt their project. And the Shirley/Annie storyline resolves nicely, with Annie actually complimenting Shirley and saying that she is genuinely glad the mother will be valedictorian. This is such a nice change from the other Shirley/Annie stories where neither had actually apologized for their actions (remember, they didn’t truly apologize to one another in “The Science of Illusion” or “Herstory of Dance” and Annie had no regrets for wanting to crush Shirley in “Intro to Knots”). It’s a nice little bit of character growth for Annie to concede her spot as top of the class in order to let a friend have it. Also, it was nice that Britta explained that she’d fill Annie in on her lunch later. I love that it seems that these two are back to being friends, because I have always lamented the fact that their respective relationships with Jeff ruined that. And then, in the most heartbreaking moment ever, after the rest of the group leaves the study room, Britta tugs on Troy’s hand and pulls him in for an embrace. The pair stands like, wordlessly, for a while. And we’re reminded in that moment that life is cyclical for a lot of these characters. That their journeys can be paralleled from how they entered Greendale to how they’ll exit it. And Britta and Troy end their relationship the same way they began it – holding onto only each other. - I WANT ABED’S TARDIS SHIRT. - I need to count the number of times that Jeff interrupts people throughout the episode because it’s quite hilarious. Thanks for reading and for joining me! :) We're fast approaching the end of this season, and with only two more episodes to go, it seems important that the group reflect on the origins of the study group itself, as well as their own personal journeys. What led everyone to Greendale? Did destiny bring their paths together? We'll find out when we watch "Heroic Origins"! Yay! I always read your reviews, but I never comment, so here's one. Thanks for such a thoughtful and insightful review. Gillian was absolutely fantastic, and she makes Britta such a sympathetic and silently heroic character. I ship Britta x Happiness! And I agree with you about how impactful Troy-as-Abed's line about how guilty he would feel if he destroyed his friendship with Britta was. I was initially annoyed at Troy acting like a child, but that made me realize what a precarious position he was in, and how deeply it was affecting him. Season 3 Troy is my favorite character, and I hope that the writers develop him back to that point next season (*Fingers crossed* and prayers up! ), as he has been pretty regressed this season. I'm going to start commenting on all your reviews now lol! I felt frustrated that they really didn't give us what we would want from the Troy/Britta relationship so it sucked so they had to kill it. The whole duration of their relationship has been about Britta competing with Abed for Troy's attentions. WHATEVER. T/B could have been great. What a shame!